I would love to see pics and hear about everyone's outdoor enclosures for their herps. I am most interested in the materials used and construction design. I just started digging a pond for turtles but haven't settled on what the perimeter is going to made of or look like. If anyone has any tips or things they would do differently I would love to hear about them. 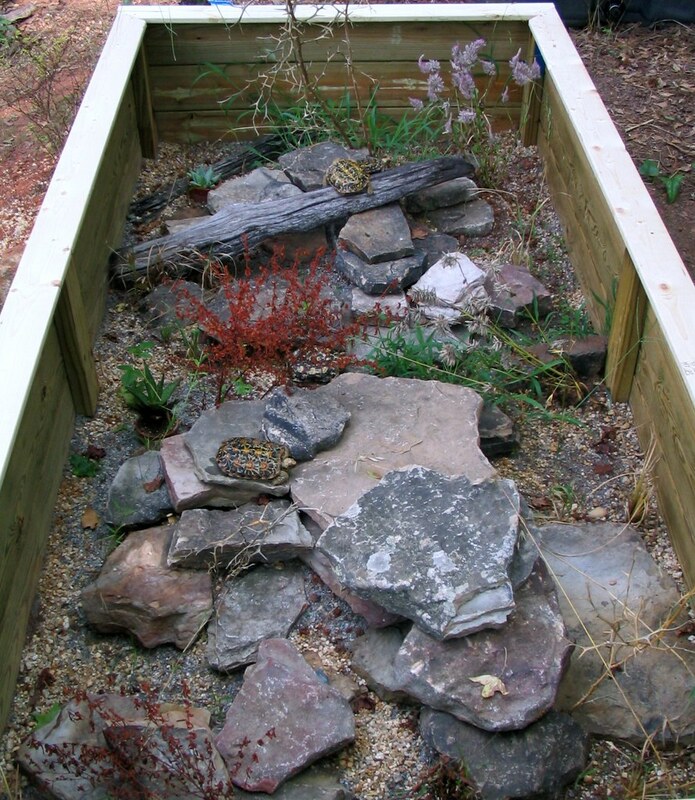 I'll share a scanned photo from an enclosure I built in middle school initially for box turtles. This was one of the earliest versions. It changed size and location in the yard a few times over the years but held the same basic design. I also had a 60 gallon prefab pond in their for a while that held spotted turtles and European pond turtles for a season. 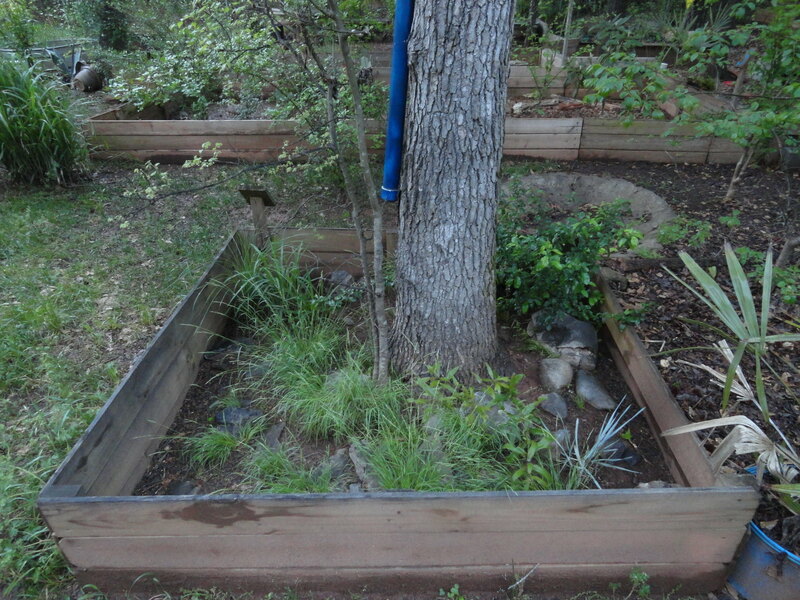 The box turtles would hibernate in a big pit that I dug and filled with grass clippings and leaves. The sides are made from old rr ties (yes the ones filled with creosote) that lasted 20+ years in the yard for all sorts of landscaping. Nailed to it is hardware cloth that is bent over on the top to prevent turtles from climbing out. The wire is sunk about 6 inches into the ground. Here are some pictures and details about my enclosure. Feel free to ask any questions. Ignore the sulcata, the point of this photograph is to note the boundary fence for the enclosure that is on the roof of the burrow. There is also a pond in this enclosure. My boss keeps a collected of aquatic turtles such as softshells, cooters, florida red bellies, and I believe a painted turtle in the pond, and has the sulcata wandering around on the land section. During winter he brings the sulcata inside and keeps it in our lab. The enclosure covers an area about 50-75 feet long (just guessing on size from memory) and about 25-40 feet wide. The fence is set into the ground by about 10 inches to keep anything from digging under it. I think there is several lengths of fence, because there are parts where it appears two fences have been connected by wrapping the ends of the fences around the "bars" on the adjoining fence. To keep water in the pond when it gets low we run a hose to the pond and leave it on. I don't know what this is like on the water bill at work, but we get well water so, free from Florida aquifer? Regal Ringneck has a great example of snake outdoor environment. All the environments you guys here have shown are so great. 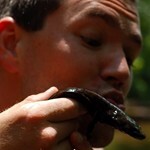 its a wonderful way to do herpetoculture. I had a brief rooftop day environment for a sulcatta juvenile and some Asian box turtles, and a window set up that could be pushed out for some baby spotteds. always wanted to do more personally. That sounds beautiful Jim. Every One that gets to live like that heals my heart just to know it happened for them. There is also the book "A Bearded Dragon Manual". If you have it Kfen, or anyone else for that matter, In that book there is photographs of indoor-outdoor Bearded Dragon setups that could easily be repurposed for turtles and tortoises. Thanks for all the tips and ideas. I'll eventually put up a post detailing my pond build. All of my turtles and tortoises are housed outside (tropicals come in during the winter, others remain in their pens and burrow under). Here are a few pics of some of my enclosures I had on my computer at work. I'd be glad to try and dig up some others or provide more info if you need. Each of my pens is constructed of pressure treated decking board (1x6). I stack them usually 3 boards high, braced with 2x4s or 2x3s. I put a brace at each corner and about halfway down a long run of wood to keep it from bowing as it cures. They may or may not have a lip on the top (depends on the species). 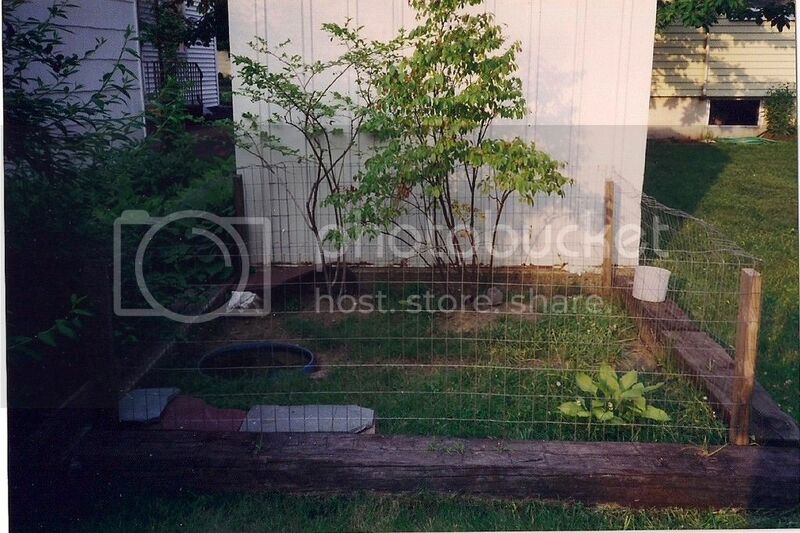 Here is a pic of the very first enclosure I built. Why it is on my computer at work, I have no idea. But you can see the general construction of the wood. I put the long sides together first, set them in place and then added the ends, securing it all together. I use essentially a riff on the same idea for each pen, just changing the size of the layout. The smallest pens are 4x4, and go all the way up to dividing the main yard. I've recently changed my style of fencing for my Manouria, after seeing some fencing in Myanmar that I thought looked really cool. I'll have to take some pics of it this weekend and share. It is vertically oriented, different heights and widths of wood (1x4 all the way to 1x12 wide, and varying from 16-24" high). I think it is kind of cool looking. Anyhow, hope that helps. Like I said, I'd be glad to show some more pics or answer any questions you may have arise. A Treat to see! Fantastic living areas!! Berkeley, thanks for all the pics! I would love to see your new design for Manouria. I am trying to find a happy medium between function, aesthetics, and cost. Are you not concerned about predators because of that chain link I saw in one of the pics? There are a few cats that belong to my neighbors that I am concerned about. I cant stand that they visit my yard frequently. I witnessed one take out a squirrel just the other day. They are forcing me to have to include a high fence of some kind. I will likely have a wooden base similar to yours, with wire or netting extending up. You are certainly welcome, Kfen. Yes, that balance of function, aesthetics and cost can be a bit tricky. The chain link fence that you noticed is a big predator deterrent, that is correct. We are also fortunate to live in a neighborhood that is (knock on wood!) free from raccoons/possums/coyotes. We have lots of squirrels though (I HATE those freaking things), but they tend to stay out of the backyard for the most part. I think it also helps that we have two 'tough-boy' cats that keep others out of the yard. You'd mentioned a high fence around your enclosure itself. What about a liftable (or even removable) framed mesh lid? I've got some reference pics I have saved if I ever had to use such a design. I'll see if I can get them posted for you to see. Essentially, you frame out a lid with a screen/mesh size of your choice (chicken wire would be a good one, that is the one I would use), attach some good hinges, and use long poles to prop the lids up when you are wanting to work in the pen. I've seen them in use on large pens too, just sectioned into smaller parts (say, 4x8'), each individually hinged and propped. The nice thing about a tight fitting lid is that a) it is low profile and wouldn't be visually obtrusive like a high wire fence would be, and b) you can add a hasp and a lock. Berkeley, do your "tough boy" cats not bother any of the chelonians? Do you have anything going into the soil to prevent digging escapes? I have seen liftable mesh covers before, and they can look very clean and unobtrusive. However, It wont work on my enclosure because of size. The pond itself is 18 by 10 and I plan to have a sizeable land area all around landscaped with some shrubs and tall grasses. The cats really don't bother the chelonians at all, Kfen. They both go into the yard regularly, and even get locked in periodically, but have never so much as touched one of them. One cat likes to climb into the pens and tubs and watch the smaller turtles, the other likes to plop right down among the big guys. I don't really put down much in the way of digging obstructions. 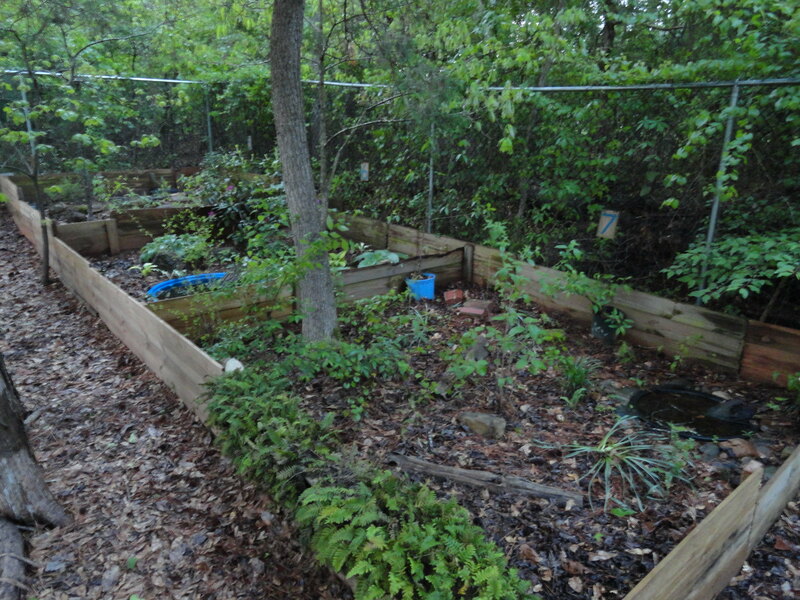 In the past, I have put some bricks down in the soil in each corner of some of the pens (e.g. Russians, Hermanns, etc) but didn't really find that digging was an issue. Wow! 10x18! I presume you are going to line the pond? That is awesome! I can't wait to see that. Yes, I suppose that an enclosure that big would preclude having a lid over the top of it.... ha ha! I did find that I had a pic of the new fence style I was mentioning. I built a couple of small sections earlier this year to see if they were climb-able by the tortoises. So far so good, so this winter I am going to redo the large runs of fence with it. Yeah, tortoises and turtles generally don't "dig up". So if you are worried about digging at all, if you burry the fence into the ground just a few inches, digging won't be an issue. To cover my bases, tortoises will sort of "dig up" but only if they are cleaning out their burrow after a cave-in incident. They can push loose soil out of the way, but it seems they can't dig upwards through packed soil. Berkeley Boone wrote: Wow! 10x18! I presume you are going to line the pond? That is awesome! I can't wait to see that. Me either! haha. It's taking me a little longer than I wanted to get it set up. Yes I am using an EDPM liner, and hoping to pick it up tomorrow. It is mostly dug, but I still have to wrestle the liner and then lug lots of rocks around. THat vertical fencing is pretty neat. Are there horizontal supports on the other side of the fence that I am not seeing? If that's the case, than can I assume the foreground is the outside of the enclosure? simus343 wrote: Yeah, tortoises and turtles generally don't "dig up". So if you are worried about digging at all, if you burry the fence into the ground just a few inches, digging won't be an issue. I was going to say this as well. I feel as though people over emphasize the need to bury fencing in the ground. My experience has been the same as yours. I have sunk fencing a few inches just to make sure no mammals dig in or out and create an escape route for the turtles. Kfen wrote: THat vertical fencing is pretty neat. Are there horizontal supports on the other side of the fence that I am not seeing? If that's the case, than can I assume the foreground is the outside of the enclosure? Thanks! I like how it has turned out. Yep, there are horizontal supports on the backside of the fence, and then vertical posts every so often that are sunk down into the ground. The foreground is actually the inside of the enclosure. Those Manouria are climbers! So I wanted to present them with a flat surface so that they didn't have any footholds. And yes, people absolutely over-emphasize the need for baffles to prevent digging out! Diggers are also less inclined to focus compulsively in an enriched captive environment. This is a really wonderful thread, one to put on favorites. I am also considering outdoor enclosures. It seems like a good way to go but as I am also in CT, the 4' frost line is a big concern. I cannot dig so deeply. I would like to put out an enclosure with European Legless lizards but have yet been unable to convince myself of how I could keep the frost to the level I can dig (about 2'). stlouisdude wrote: I am also considering outdoor enclosures. It seems like a good way to go but as I am also in CT, the 4' frost line is a big concern. I cannot dig so deeply. 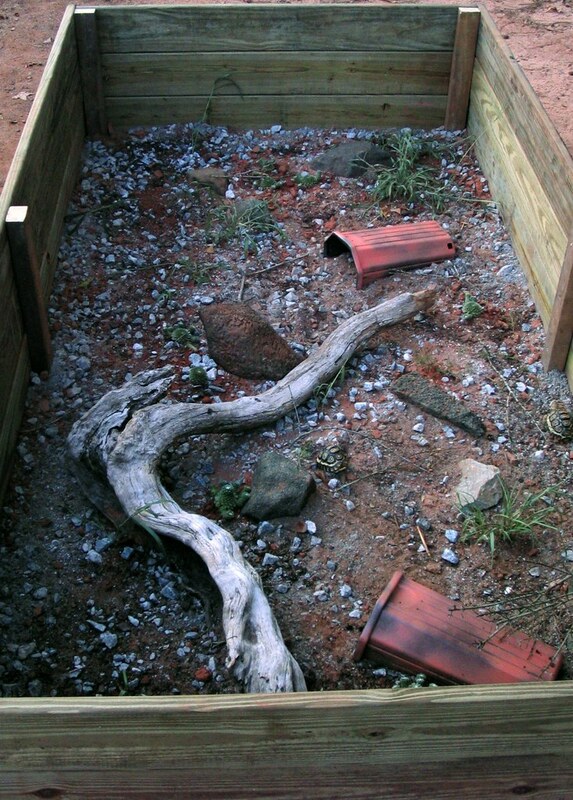 I would like to put out an enclosure with European Legless lizards but have yet been unable to convince myself of how I could keep the frost to the level I can dig (about 2'). What happens when you hit two feet? Rock? Water table? Do you have a cold garage, shed, or basement? You could bring the animals in to one of those places for hibernation. Make sure their burrow outside is accessible to you and just dig them up before the real hard freezes hit. If any of those places are just a little too cold, you could build an insulated box with a heating element and thermostat to keep it at the right hibernating temp. The other idea is to build their outdoor enclosure up against the house. If they can get right up against the foundation 2 feet deep, I doubt it would freeze there. Throw some thermometers around this winter to see what happens. There are often microclimates in and around your house that would be suitable. My garage that is under part of my house is generally in the mid 50's in winter. But on the floor in the corner is more like mid 40's. Ya around 2', I start getting into some serious rock. I am situated on top of a hill. I hadn't thought about going right up against the foundation. That could work and I bet it's easier to dig there, too. I wonder if there is anything I can rent short of heavy equipment to help blast through the rocks and make digging easier too but have found nothing yet. I wonder if there is anything I can rent short of heavy equipment to help blast through the rocks and make digging easier too but have found nothing yet. The clay spade is really helpful. Edited to add: It won't do much if you are hitting cobble though. Thanks for the link, I've also been looking at cold frames for gardens, I think between the tool and arranging it a bit like a cold frame for the darkest days of winter, I should be able to keep the frost to a minimum. I am going to give it a shot this year and see what happens. 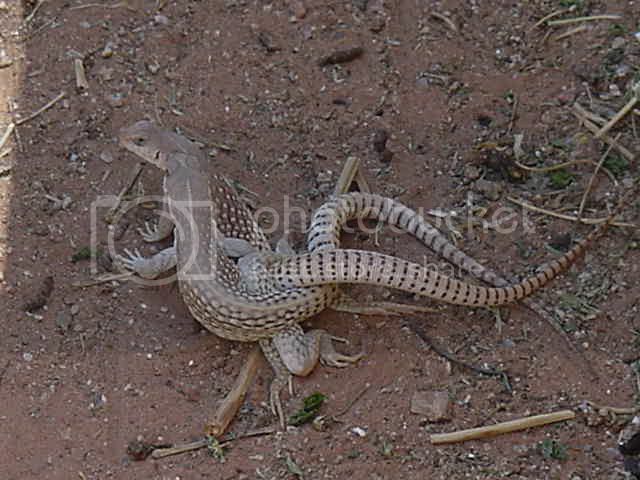 Herpetoculture as lens - and a razors edge. Sometimes especially in what has been presented here, the resources and factors present in the keeping strategy make the perimeters of containment inconsequential to its inhabitant, or greatly reduced perceptually in the scheme of its activity and behaviors. This is especially possible in outdoor environments with the climate and habitat knowledge that John, Berkeley and others have. But the knowledge they apply is key, just being in an outdoor situ doesn't guarantee anything, as seen in many overseas tourist snake zoos for example. Thanks for the kind words, they made me smile (and still smiling)..
Beautiful pictures of vibrant lives you share. Tell you what - if I can ever get out of this place, it would be to move toward your way. Cant stand the weather here. I would definitely want to get some outdoor enclosures going, or at least one to really focus on. ... fd. buried in a family folder ... poppa's lil helper : ] ... my poor back hurts all over again just to look @ these ... and now, as i await her 2'nd baby ... i am once again struck with that where does ones life go & how could it possibly get "there" so g-d fast ! Its so good to see a snake in something like that. So dang good!